These Arkansas businesses have earned the distinction of being named among the state’s Best Places to Work. The survey for the Best Places to Work is one of the smartest investments our company makes, and the results have changed our workplace. 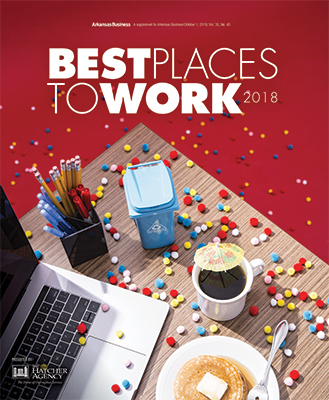 As we shall see in this year's Best Places to Work profiles, ice cream socials, employee contests, parties, incentives and health plans all help create a positive place to work, but don't overlook the role of the physical environment. Located on the 16th floor in the Simmons Tower, the Information Network of Arkansas (INA) offices serve as a second home for employees, who rave about the company's generous benefits packages, the unique office setup and the endless recognition from management and coworkers. ABC Financial Services has grown to become the No. 1 service provider in the fitness software and accounts receivable management fields. Standards are high at Acxiom Corporation, so it's no surprise that Acxiom empowers its employees to accomplish exceptional things for clients. Advantage Service Company (ASC) invests in its team. Ally Financial is a leading digital financial services company known for its unique culture, simple approach and customer-centric business philosophy. Health care isn't just the field that Arkansas Blue Cross and Blue Shield works in. The company actively works to improve employees' health and wellness. Arkansas Electric Cooperative Corporation (AECC) is a nonprofit energy company that provides electricity to more than 1.2 million Arkansans. Understanding that employees are the key to company success, AECC works to make employees feel engaged, empowered and safe. The Arkansas Federal Credit Union (AFCU) is dedicated to giving back to the community and its employees. BNSF Logistics (BNSFL) is one of the nation's fastest growing, third-party logistics companies, handling everything from multi-modal freight movement around the world to simple transportation solutions across the country. Braswell & Son Pawnbrokers continues to follow its mission of serving the short-term financial needs of the community. Instead of feeling like a slow-growing small business, BSR generates the performance typical of an up-and-coming startup. CaseStack, an outsourced logistics provider headquartered in Santa Monica, California, and Fayetteville, helps national retailers and consumer packaged goods companies meet demands by creating a more sustainable supply chain. Wellness is a big deal at Conway Regional. Datamax nurtures a company culture that empowers and celebrates employees. Delta Dental of Arkansas is the largest provider of dental benefits in the state, but it provides for its employees too. Edafio Technology Partners has grown by leaps and bounds since it was founded in 2001. Entegrity believes the strength of a company is measured not by the prominence of its brand or size of its footprint, but by the sum of experiences its people bring to work daily and by the values each employee applies to tasks large and small. FAB&T is built on the pillars of customer and community service, but the foundation is its employees. FNBC Bank demonstrates that a bank can be much greater than its balance sheet; it can be a powerful catalyst for individuals to pursue and achieve their highest career and community aspirations. Even with its sprawling presence, which includes offices in Little Rock and Fort Smith, Gallagher cares about the individual employee. Harbor House learned its lessons by listening to employees' experiences with what works and what doesn't in order to best help people dealing with addiction. The leadership at Harrison Energy Partners values its employees, and employees say they don't feel like just a number, they are family. Celebrating 20 years of providing community medical and dental care, Healthy Connections, Inc., is not just a name but an experience. Kimbel Mechanical Systems hires people for who they are, not what they are, then helps them be all they can be. Mitchell Communications Group is one of the fastest-growing women-led public relations organizations in the nation and was founded on a commitment to diversity and inclusion. The employees' passion, personality and positive attitude have been a magical recipe for Movista's success and the company doesn't take that for granted. Incentive software company Perks WorldWide strives among other things to promote customer loyalty for its clients. In addition to being the state's largest plaintiff law firm, Rainwater Holt & Sexton is also progressive when it comes to workplace culture in the legal industry. To fulfill its mission, “improving quality of life one home at a time,” Rausch Coleman Homes first serves its employees. The cornerstone of RevUnit's culture is a shared set of values to which it holds itself as a company and its teammates accountable in all daily work. As it has grown, Simmons has provided employees with a choice of paid medical options, a 401(k) with a 100-percent vested match, fitness incentives and paid leave time and reimbursements to ease the burdens of military deployment. St. Bernards is the largest employer in northeast Arkansas but employees say it has a feeling of family. Arranging for the movement of more than 30,000 shipments each week is no easy task, but Total Quality Logistics (TQL) has a culture that makes work rewarding. Boosting morale and increasing employee engagement are daily goals at Travel Nurse Across America. USAble Life is in business to help companies provide benefits for the well-being of their employees. VCC Construction understands the importance of human connection and appreciates that its people are one of the primary reasons for its success. With locations in six states, WELSCO is a family-owned business committed to family values, positive attitudes, integrity, shared knowledge and respect for others and the community.